When one kid sleeps, the other is awake. When one kid is happy, the other is fussy. When one kid has a dirty diaper, well they both end up with dirty diapers. But, sometimes the cosmos align like they did this afternoon, and they are calm and asleep at the SAME time. 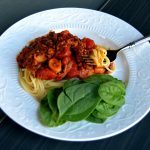 So while I would love to pass out on my face, I felt compelled to share this go-to recipe for homemade spaghetti sauce that gets me through times like these that maybe you could use too. It is incredibly easy, always impresses, and was one of the first dinners I learned to cook. It was also one of the first dinners I cooked my now-husband (I was trying to be so smooth that I let it slide off the plate and onto the table when serving, he was so impressed). Sometimes you just can’t beat the comfort that pasta and the sweet aroma of oregano brings after a hard day. Using canned tomatoes definitely has it’s benefits as they are rich in the antioxidant lycopene. Lycopene is most well known to reduce risk of prostate cancer, but it also helps reduce the risk of breast, lung, colon, and bladder cancers, not to mention very good for your heart. And if you choose ones with no-added salt, you don’t need to worry about all that extra sodium. I honestly do not notice a taste difference either. When making this recipe, you may think this has a ton of oregano. It does, and it’s delicious. Remember, if you don’t add oregano, it’s just….chili. 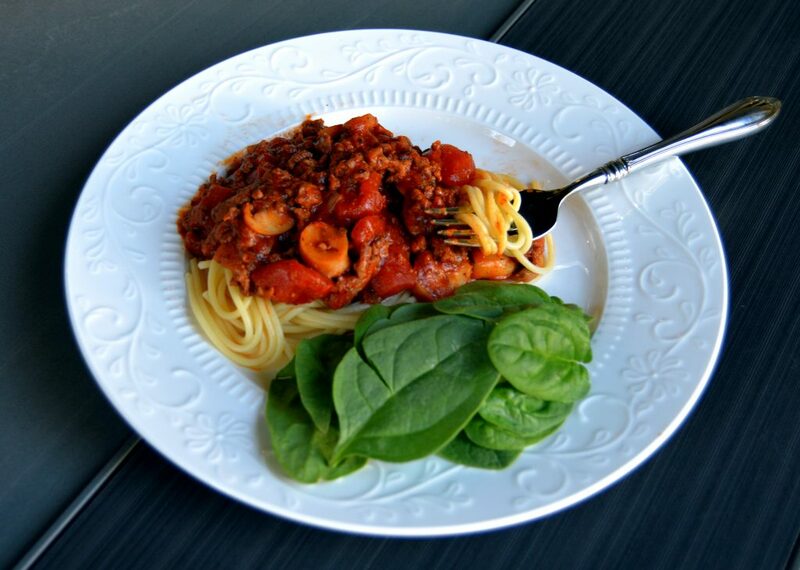 A fabulously easy dinner to throw together without resorting to the jarred stuff. Add tomato sauce, tomato soup, and diced tomatoes (and add mushrooms and black olives if desired). Add all seasonings, make sure you don't forget the oregano! Mix well. Let simmer for about 20-25 minutes, stirring occasionally. Meanwhile boil water for the pasta of your choice. Serve over cooked pasta immediately. Wonderful with spinach salad and a chunk of garlic bread. This is so quick if you have the ingredients on hand–heck you don’t even have to have your ground beef totally thawed (I usually forget to thaw beforehand). Pair it with a spinach salad as the vitamin C from the tomatoes will help you absorb the iron in the leafy greens. Whip this up for your family tonight and let me know what you think! If you are looking for ways to improve your health and haven’t checked out my shop classes tab yet, I encourage you to take a quick peek. I now have convenient webinars that you can watch anywhere. Live ones so you can have the opportunity for Q & A with a dietitian, or recorded ones you can watch anytime. My next live class is Carbohydrate Counting Made Easy on August 15 at 7pm central. It is definitely my most popular class because it is such an amazingly easy way to learn proper portion sizes and make sure your diet is balanced. 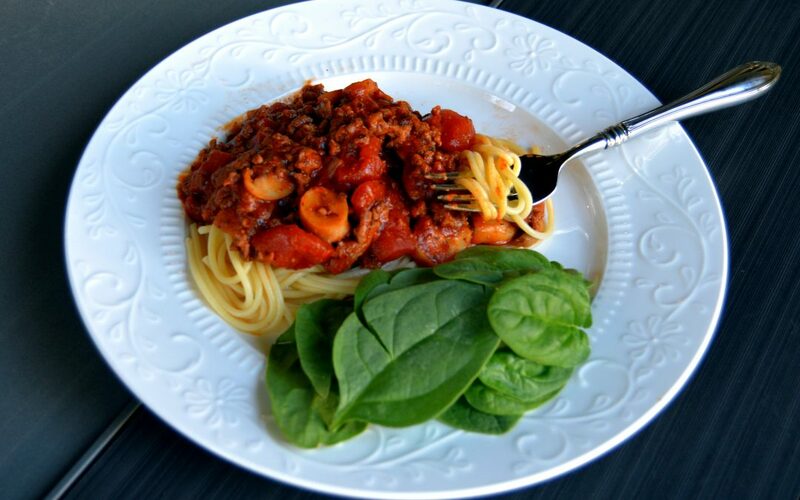 Homemade spaghetti sauce is just so comforting! Love it! Homemade sauce is always the best. Looks like you nailed this one! Oh Nice! Tomato soup is the secret ingredient! I’ll have to try this! thanks! It makes it so yummy, hope you enjoy! Nothing better than homemade spaghetti sauce! Great post! 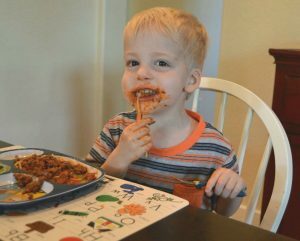 Spaghetti is a favourite for everyone in out house as well!